When it comes to poker festivals in the Philippines, many international players tend to follow the Asian Poker Tour and PokerStars. Unsurprisingly so, as these well-established brands have developed a strong international following and tend to muster up huge prize pools. However, despite the lure of these giants, there is one local poker brand standing strong against all odds: The Metro Card Club. Coming next month, “The Metro”, as most commonly called, will soon be hosting its richest poker festival of the year, the RVS CUP Philippine Poker Championship 2017. This event will take place from November 15th – 20th featuring a whopping PHP5,000,000 guaranteed Main Event (US$96,500 approx). In celebration of the Metro’s 10th year in the industry, the entry fee has been generously slashed down from PHP10,000 to a highly affordable PHP5,000 (US$100 approx). With this enticing buy-in, and if history is proof, the room will most certainly be packed with players, local and foreign, recreational and pros. The six day event will see its first four days dedicated to the Day 1s followed by Day 2 and the Final Day. In addition to the Main Event, the festival will also offer five side events and a pre-event. For the past few years, the RVS CUP has been the most anticipated Metro Event among the locals. 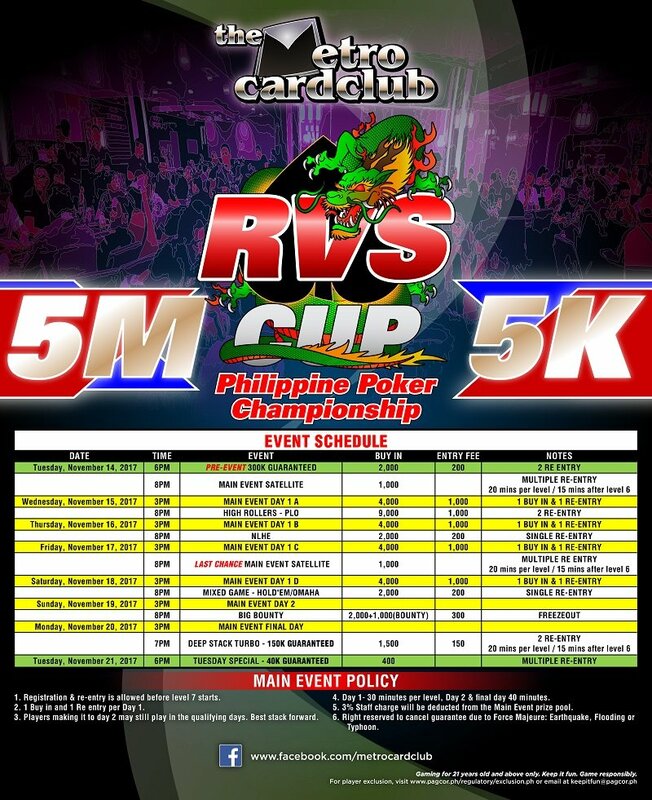 The first RVS CUP was held in 2014 with a guarantee of PHP5M. Poker pro Lester Edoc went on to win it. Since then the guarantee has remained where it is today but the buy-in for this edition has been lowered to PHP5,000. In 2015, another well-known local player took the crown, Richard “Hotsauce” Marquez. Then last year, local player Anacleto Quijano became the third champion of the RVS CUP. Between the three winners, Marquez collected the largest first prize of PHP1,700,000 (US$36,050) overcoming a massive field of 644 entrants. From its start in 2007 to today, the Metro has consistently been the most popular card room in the Philippines. The growth of poker in the country is largely due to the Metro’s efforts. In its early years, it was host to the biggest poker festivals such as the Filipino Poker Tour and APPT events. Majority of the local pros we know today such as John Tech, Mike Takayama, Lester Edoc, Flo Campomanes, and the Rivera brothers, all patronized the Metro and continue to support its events today. In comparison to other poker venues, it is safe to say that the Metro may be the largest brick and mortar poker room not just in the Philippines but in all of Asia. It accommodates up to 30 tables with a separate room for higher stakes. Impressively, despite it not being located within the premises of a resort / casino nor affiliated with any online brand, the Metro has withstood its competition. Due to its loyal following, the place is usually packed at night with both cash games and tournaments running simultaneously. The Metro Card Club is located on Bldg. C Bazaar Area, Metrowalk Commercial Complex in Ortigas Center, Pasig City, Philippines. The place is open 24 hours daily.